All around the world there are understandably different ways of anticipating and finally celebrating the Yuletide or Christmas season. Some countries light fireworks just as many would on the coming of the New Year. Some light a symbolic Yule log on their fireplaces, or hang up piñatas for the children to take turns trying to smash while blindfolded. Perhaps the greatest variation could be found in the food that’s eaten in the special meal of the day. It can range from Christmas ham in general, to American turkey, to English goose, or Danish duck, so on and so forth. Mind you, these are expected in countries that have been predominantly Christian for centuries, but what of a nation that isn’t? Take for instance Japan. Its population of practicing Christians amounts to barely over one percent. As a result, the joyous Christmas season isn’t considered an official Holiday. Therefore there’s really no driving reason for Japanese to toil in the kitchen just to make a centerpiece meal like ham or some whole roasted poultry. In fact, Christmas in Japan would be nothing more than a special romantic date night for couples, had it not been for the presence of an American fast-food franchise that had a local store manager begin a holiday treat that’s now an entrenched part of Japan’s secular celebration of their Christmas Season. According to BBC, this western franchise in none other than Kentucky Fried Chicken, and yes, Japanese families can opt to celebrate the Yuletide by something as basic as gathering at home for a big bucket of KFC original-recipe with secret-herbs- and-spices fried chicken. Sounds wacky, isn’t it? Well here’s how it started. In 1970 the first Japanese KFC branch opened. As Christmas time that year arrived, the manager Takeshi Okawara overheard two American tourists eating in his store about how they were missing having turkey for the Holidays. This inspired Okawara, who had studied at Harvard, to develop a Christmas party package for his restaurant in December, in the belief that some good old fried chicken would be a passable turkey substitute. His plan was a success and became a national institution for all Japanese KFC stores by 1974, known as “Kurisumasu ni wa Kentakii” (Kentucky for Christmas), with a chicken bucket, Christmas cake and even wine for the whole family. Okawara’s brainstorm later saw him serve as Japan CEO for KFC from 1984 to 2002. Would you believe that a commercial venture could become a genuine tradition? It could in Japan, and only in Japan. While a chicken bucket is special enough to the Japanese on Christmas, a westerner pulling that stunt back in the US would be a laughingstock. 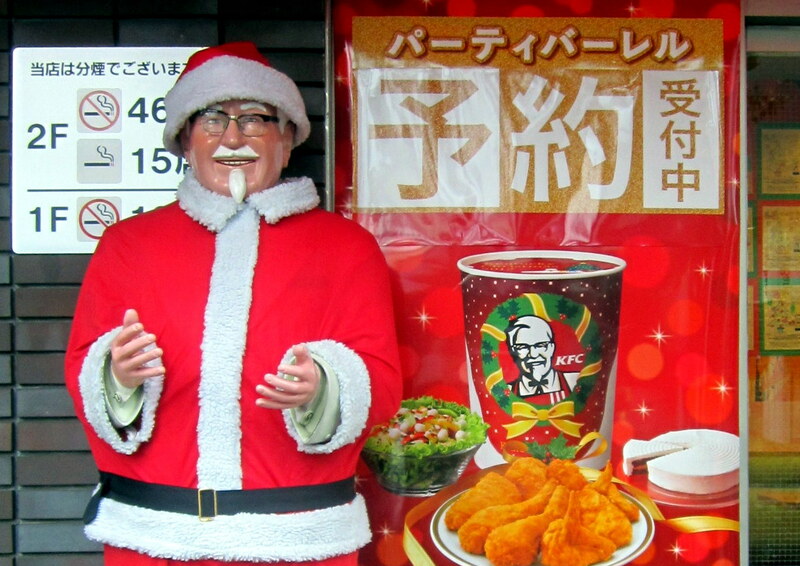 Regardless of its origins however, Japan has wholeheartedly embraced KFC for Christmas, as a delicious way for a family to get together for a working Holiday. Its really nice to know Japanese KFc tradition and while placing kfc online order I got great deal from shopozo in ther kfc offers page.